I’ve bought myself a Netgear WNDR3800 and put OpenWrt on it. I’m loving it! It’s not as easy to use as Tomato but it is much, much more modular and configurable. One of the first things I did was installing OpenVPN on it. 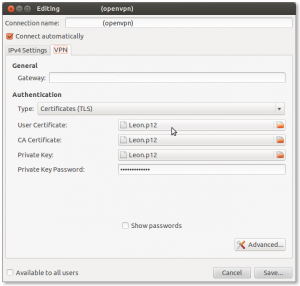 Currently I have OpenVPN running on my Pandaboard but if it was possible I would like to have OpenVPN running on my router. My previous setup used three separate certificates/keys: a user certificate, a CA certificate and a private key (and actually a ta.key). I used the build-key command to generate a new user certificate on the router which generated a *.p12 file. I first wanted to extract the three different certificates from the PKCS12 file but it appears that Network Manager can use those files. After that the creation of the crl.pem succeeded. I tried some time ago to make the Subject Matching work in Network Manager but I kept getting errors. This time I persisted and I got it working. It all had to do with the format of tls-remote (same thing, but this is the way openvpn calls it). openssl x509 -in router.vanutsteen.nl.crt -text -noout | grep "Subject:"
Now, everything should work as planned!